Mac N Cheese Topic #1 – Staying Positive? Anyhow, the brunch club is a way for the stay home moms to get together and talk about something besides which cartoons are the best and where to buy the best bargained clothes….o.k. 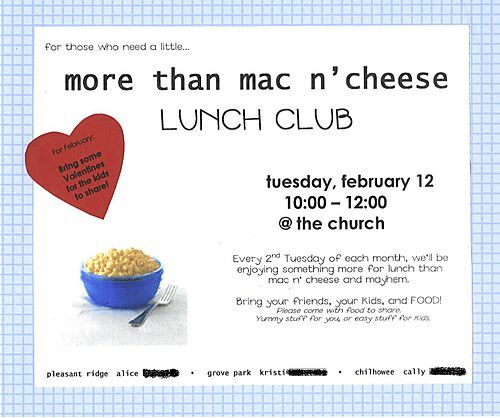 it really is the whole point of the gathering to talk about stuff like that, but, hey, the perk is in the food….what’s better than mac n cheese? Just about anything when you are a mother of a toddler! At the first brunch, we determined the monthly topics for the rest of the year. So feel free to give me feedback! If you can give me one good thing to say, I will seem smart and I won’t even have to waste precious blogging time researching the topic. Good plan, huh? March’s theme: How to stay positive. thought: What the hell good would that do? Do you think the ladies will be offended by the H-E- double hockey sticks? I can’t leave it out, that word just makes the quote so much better. My 2 cents to add to the quote. Like Shakes, I don’t think we learn about being positive from reading a book. The thing that is the most helpful in keeping me positive: humor. And they say that humor is rooted in tragedy. Wow, my life is looking more upbeat already. That is such a good idea! We need something like that around here. I go visiting teaching and could stay all day because it is ADULT CONVERSATION! I am not saying this is a bad idea at all, but I sometimes think those moms who have to work may feel even more alienated from these sisters who get together and build friendships. I don’t know the answer though. I don’t usually comment on my own blog, but I feel that the last comment deserves a reply.When I quit working to stay home with our first daughter, I felt extremely alienated. Over night, I didn’t fit back into my working friend crowd. When I used to have wonderful conversation every day for breaks and the heavenly lunch hour, I now had nothing.My husband was working full-time and going to school full-time and my ward did nothing to foster friendships. I spiraled into a deep depression (which is a crying shame because this should have been one of the happiest times of my life)I no have good friends who both work and don’t work.I think that this working mom vs. non-working mom is tearing the women of our church apart. Read Jayne Clayson’s book, “I am a mother”You suggesting that stay home mothers should not get together because the working mothers would feel left out is as ridiculous as someone suggesting that working mothers quit talking to their co-workers because stay home mom’s can’t handle the adult conversation that thay get.Truth be known, women (working or not) can always find a reason to be hurt because other women build better friendships. (If we are worried about that, let’s just release all auxilary presidencies -don’t they foster greater friendships also? )Working moms make a choice just as stay home moms do. Each person needs to make their choice and embrace what they are doing. While they embrace what they choose to do, they need to reach across the aisle to the woman that chooses the other route.Just because women are getting together because they desperately need adult conversation does not mean that they don’t love and care for their working sisters.Working moms may feel left out, but if they will step out of their skin and try and see what a stay home mom goes through every day, they may be a little more supportive of them actually getting out of the house. I have to comment again here, sorry.I totally agree with you , Alice. I think it can also include not just the “stay-at-home” and the “working”, but everyone in different stages of life.Paul and I went to dinner Friday night with a couple who are our parents age. And their 28 yr old daughter babysat our kids (I’m 27). They are our fiends and we had so much fun! Never in a million years would we have thought that we would hang out with “old foggies”. It was so hard when we first moved here and “no one seemed to be in the same stage that we were in”. I was so naive. In fact, every single girl that goes to our night out is in a different stage, working, stay-at-home, empty nester, songle. No one feels alienated there. We are just happy to be with one another. You did a great job, i had a blast, and I did notice you changed your blog name! I like it, because you are really not THAT cynical! I also have to comment on your anon. blogger. Women need each other, and just because one works and one doesn’t make any difference on the way we feel. I love my friend that work, just as much as the ones that don’t and you can spend time with all of the above if time is made from BOTH parties. I always comment on my own blog. Sometimes, I comment to myself! LOL, I think it is a great idea. For those mom’s working maybe one day a month they could plan a dinner and meet at a restaurant. We do something like this in our own ward.